Quadcopter drones are built specifically for an easy takeoff and stable flight, but landing can be a tricky task. They generally need to land on flat ground or risk toppling over. Bhargav Gajjar, a roboticist based out of MIT and Vishwa Robotics, has built a drone to solve that problem. According to New Scientist, which published a video of a working prototype Monday, Gajjar used a high-speed camera to capture how dozens of types of birds land. He then built a drone with robotic legs that emulate the American kestrel’s. 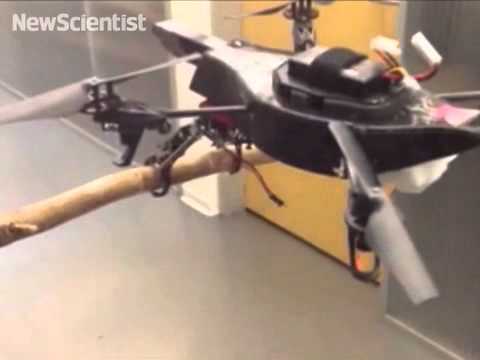 The video depicts a quadcopter taking off and then smoothly landing on a branch a few feet in the air. The feet are strong enough that it can turn off its motors altogether. It uses no power while perching. New Scientist reports that the drone accomplishes the landing by braking just before it lands, and the legs act as shock absorbers as it touches down on the perch. This mimics how live birds land. Its claws are very sharp, which makes it harder to break its grip. Gajjar told a member of Harris Communications Group in 2011 that he received NASA funding to build a battery-powered surveillance drone. His new drone, which is equipped with a camera and battery powered, seems to be the result of this work. New Scientist says that because it’s larger than other bird-like drones, it can pack a larger battery and, as a result, fly longer. Aside from military surveillance, the drone could also be used to spot people or provide a communications network in the case of a disaster.